Generally, I tend to take notes while listening to albums I am about to review, but Embrace My Winter by Italian newcomers Whispers of Fate pretty soon rendered that task obsolete, so I abandoned the futile exercise. On one hand, symphonic gothic genre is an area many metal musicians mine, so it is hard to be entirely original, yet the word “symphonic” implies something melodic and grandiose. 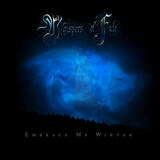 It is with sadness I have to report that in the hands of Whispers of Fate “symphonic” could not be any duller. I confess that before I popped the album in I expected a Rhapsody (of Fire) clone, with a female vocalist. Having listened to Embrace My Winter I would have gladly settled for that, even with the extra helping of Italian cheesiness. Whispers of Fate take you on a different ride, where symphonic means pompous chords with somewhat shrill guitar tone delivered over punched up in the mix drums and a significant synth background. And even that would not be bad in and of itself, if the music had some progression and motion on this album. What you get, however, is an impression of listening to the same song, pretty much non-stop, for over 30 min. Thankfully, this is a short album as the guys ran out of things to say perhaps after the second track Pain of Earth. After that, with a few tempo inflections and a short interlude Preludio D’Inverno, the album is in a mode of anticipating big drama which never develops. In the midst of this self-important pretentious playing sits the band’s female vocalist Betty. Her voice, while plenty strong, is extremely one-dimensional, and probably by design. At times reminding me of Anneke vos Girsbergen, Betty never deviates from a certain portion of the register. She never explores the lower power, touches a few higher notes, but mostly prefers to stand in the middle, gliding in between the aforementioned drums and guitars, not spicing up the overall proceedings one bit. The vocals were perhaps the last chance to give this album volume, but a few of Betty’s modulations cannot save the day. I understand that the album’s subject matter and lyrics deal with winter, cold and other world’s problems. True to that spirit, it is if the action on Embrace My Winter got frozen in time and space, without any serious movement, with an ice queen as a centerpiece. If you have to have all things gothic and can’t wait for the next Epica album, give this a chance and let me know why I am missing the point.